Luc Besson has been on record several times to voice his adoration for the Valérian and Laureline French comic book series, which he read religiously as a child and took inspiration from it for several of his films later in life, most notably the 1997 cult sci-fi film The Fifth Element. Now, he’s finally been given the chance to bring his childhood favourite to life, with a budget of €197 million coming out of both crowd-funding and his own pocket (making it the most expensive European and independent film ever made), and hardly any studio interference to get away in his grand vision. Turns out he might have actually needed that interference, because Valerian and the City of a Thousand Planets is a colossal failure that’s unengaging, overloaded with way too much CGI – pretty-looking CGI, but way too much of it regardless – and wildly dull. 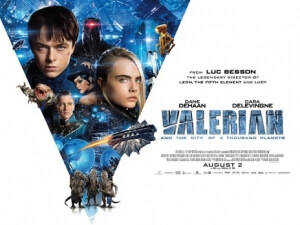 As in the comics on which the film is based, we follow two intergalactic agents named Valerian (Dane DeHaan, who for some reason acts as though he’s Bill and Ted-era Keanu Reeves for the entire thing) and Laureline (Cara Delevingne, who’s so wooden and monotone here that she might have been stealing from Hayden Christensen’s Ritalin stash), who are both assigned a mission to protect the ever-expanding space station known as Alpha, which as the title suggests is made up of a thousand different planets and alien species who all live together in some form of society. Their mission takes them through many parts of Alpha, from the depths of its seas to the neon-lit districts where pimps and entertainers reign supreme, all leading up to a messy and convoluted conclusion. Like with a lot of Luc Besson’s films, you have to admire the sheer ambition on display here. I have no knowledge of the comics that this was based on, but you can tell just by looking at some of the visuals that Besson is clearly in love with this particular universe, and has put all of his time and effort into making it look as gorgeous as he possibly can. From the alien designs to the worlds that we get glimpses of here and there, there’s at least something to please your eyes even though you’re sitting through what is a pretty unenjoyable movie; there’s lots to be said about Valerian and the City of a Thousand Planets, but it does earn points for at least trying to be as grand as it possibly can on the big screen. However, while the film does indeed boast some pretty visuals, it’s all for naught because there’s absolutely nothing else to carry you throughout this movie. The story is way too complicated to follow along with, and despite its 137 minute running time it still fails to take that time to develop or make interesting any of its characters, especially its two leads who are as bland as cream wallpaper. For some reason, almost all of the actors appear to be underacting or speaking in monotone voices in every single scene, spouting endless paragraphs of exposition and lame one-liners instead of actually being people we can root for and even get invested in, and it’s not just DeHaan and Delevingne suffering from this but also the likes of Clive Owen, who pops up as a leading authority figure in the movie, and Rihanna who pops up for a short while as a shapeshifting alien entertainer. It’s as though Besson was doing his best George Lucas impersonation, and just writing that comparison makes me realise how much this was reminding me of the Star Wars prequels, and not in a good way (and I enjoy the Star Wars prequels for what they are, much more than this). Aside from the wooden acting and endless expository dialogue, it’s also similar to the Star Wars prequels in how much this film overdoes it constantly with the CGI. As stated before, some of it can look really pretty and there is some effort to make it a creative visual experience, but it’s used for almost everything from alien designs to cities to landscape backdrops, and it just looks like one big cartoon with occasional appearances by live-action people. It probably should have been done as a fully animated film, much like how Steven Spielberg adapted another popular European comic character Tintin, because at least then the CG overload will not stand out as much, and it would also make sense seeing how it’s based on a series of drawings to begin with. But as is, it can be distracting whenever real actors show up because you’re constantly reminded that it’s all just a bunch of digital lines instead of an actual world you can live and breathe in, and when EVERYTHING seems to have been created via a computer – including several humanoid aliens who look and act like rejects from Avatar – it can get old really fast. It all just makes it a rather boring experience, because you don’t care at all about the characters, you’re not that invested in the story, and the CGI is way too much to even make you believe you’re wandering about a real alien landscape. You’re just sitting there waiting for it to be over and done with, and then forget that you ever saw it. It’s pretty much this year’s Jupiter Ascending, which makes me think that if Luc Besson really wanted to make this a bad film worth remembering as that film was, he should have called Eddie Redmayne the first chance he got – at least then, there would be something amazing to recommend about it. Valerian and the City of a Thousand Planets is a dull and unengaging waste of potential because, while director Luc Besson is clearly ambitious with his vision, it doesn’t disguise its utter lack of interesting characters, a solid story, and ability to function without an over-indulgence of (often pretty-looking) CGI.